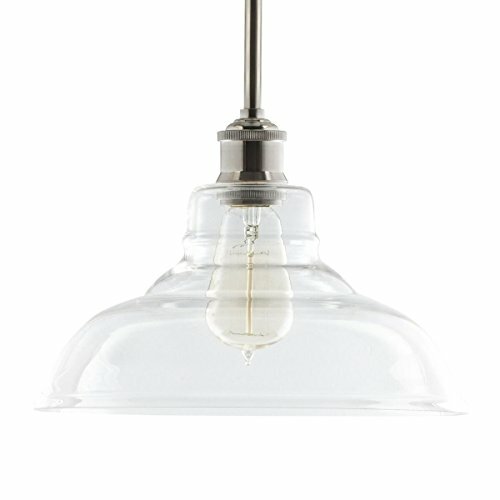 Lucera pendants are inspired by factory lighting from the early 1900's, with exposed hardware and blown glass. A clean, classic design allows use in a wide variety of environments. The Lucera Collection is available in brushed nickel, polished chrome and antique brass. An incandescent or LED Edison style bulb is recommended. Adjustable Stem Mounted: 54 inches (Max Height). Includes three 12 inch, one 8 inch, and one 4 inch hard stems for different hanging heights. Evoking early 20th century factory lighting, the Lucera collection complements a wide variety of décor, from starkly contemporary to warm farmhouse. Perfect for kitchens, over counters and islands, hallways and bathrooms. If you have any questions about this product by Linea di Liara, contact us by completing and submitting the form below. If you are looking for a specif part number, please include it with your message.